Discussion in 'Outerwear' started by Carlos840, Jul 3, 2018. So this happened, and it is blowing my mind so hard that i had to share it with my fellow leather freaks. This jacket is insane, everything about it is on another level from anything i have handled before. 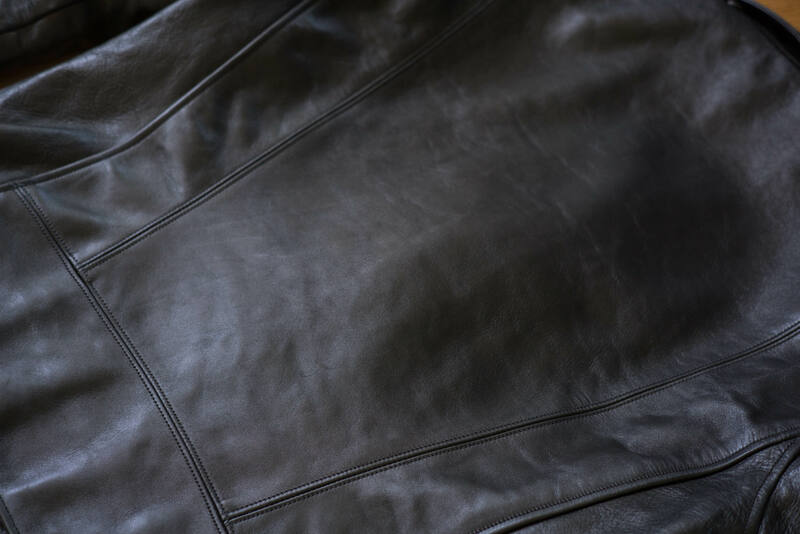 It is a "black on grey" leather, from handling it a few days, it looks like the topcoat will wear faster than average and show the grey undercoat. It is already showing where the belt rubs on the buckle and it really is grey, not the blueish tone you see on worn Schott or LL. The construction is perfect, and in mean PERFECT! In 99% of jackets if you look hard enough you can find what i like to call "oops" moments, not necessarily defects but things that the machinist probably wish he/she hadn't done... This one has nothing, it is literally stitch perfect. The stitch count is insanely high/tight, insanely even, perfectly straight, it's like it was laser stitched, i had literally not seen anything like that before. 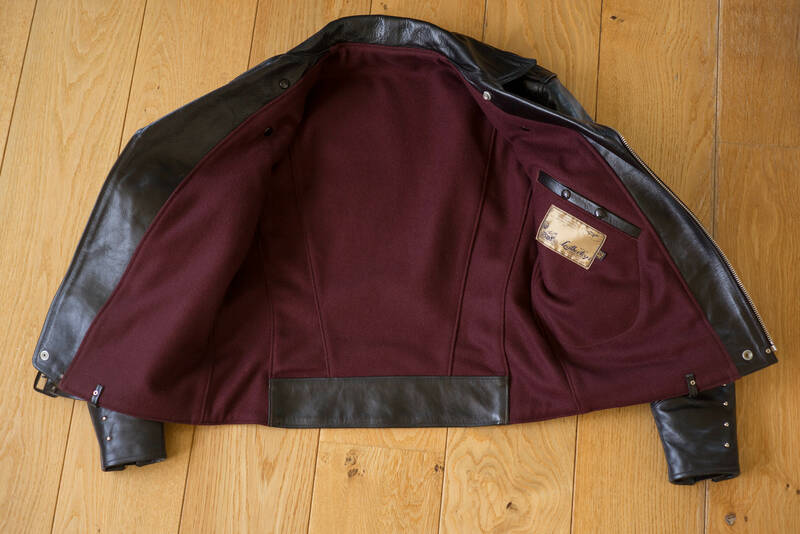 The flat triple seams are perfectly aligned and parallel, every folded seam is perfectly evenly pulled, zippers are perfectly centered, threads are perfectly trimmed, there wasn't one single sewing machine scratch anywhere on the jacket, it feels like not a single unwanted/unplanned thing happened during the construction of this jacket. It really feels like a masterpiece! The design is great, very simple, but full of small interesting details everywhere, the spots on the sleeves, the cuffs with the windflaps instead of gussets and the anti-scratch pads glued on the zippers (never seen that before! ), the throat latch, the hidden pocket, the lining that follows the same panel construction as the leather shell, the great repro label, it's like they really tried to nail every small detail that only the most OCD people would worry about. Fit wise i am happy, the pattern is similar to my chevalier (same underarm gussets and arm shape) the body is definitely on the short side, but i think it works and looks good. The shoulders are surprisingly wide for the size of the jacket, it is extremely V shaped, with wide shoulders, thin waist, and short body compared to arms. The arms have a very comfortable shape, with a strong curvature, added to the wide shoulders it feels very comfortable sitting with your arms forward in a motorcycle position. Sitting down, front, back and arms feel the perfect length, and a longer body would have actually been a pain as the drop front would have definitely made the jacket ride up a little. All in all, i have really nothing bad to say, this jacket is everything i hoped it would be and more. For me this is as good as it gets, i might even be done with my leather search! The jacket was ordered from Japan, (the rising/mirror ball) and i have nothing bad to say about them, they were quick to answer my questions, removed japanese tax from the price without being asked, and shipped as a present within a day of receiving payment. Expect google translate English, but they get it done. MET, scottyrocks, Menocore and 24 others like this. Wow! Amazing looking jacket and perfect fit! The stitch count is insanely tight, insanely even, perfectly straight, it's like it was laser stitched, i had literally not seen anything like that before. 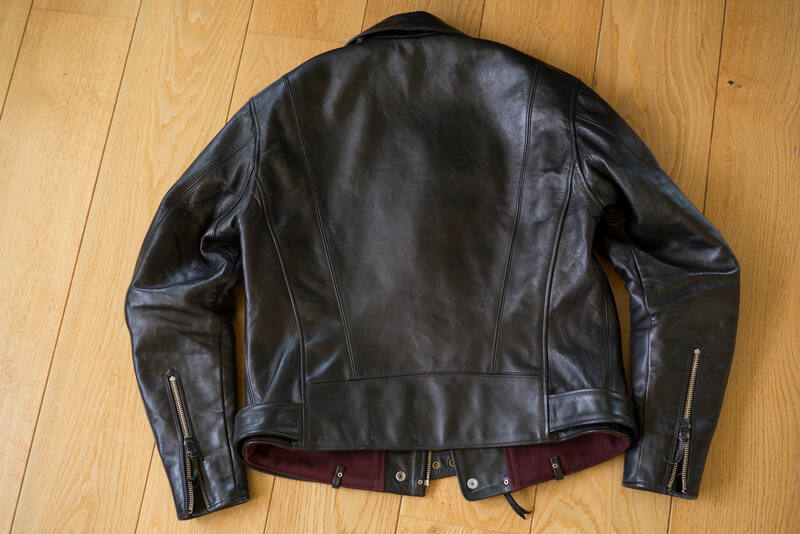 The flat triple seams are perfectly aligned and parallel, every folded seam is perfectly evenly pulled, zippers are perfectly centered, threads are perfectly trimmed, there wasn't one single sewing machine scratch anywhere on the jacket, it feels like not a single unwanted/unplanned thing happened during the construction of this jacket. The arms have a very comfortable shape, with a strong curvature, it feels very comfortable sitting with your arms forward in a motorcycle position. 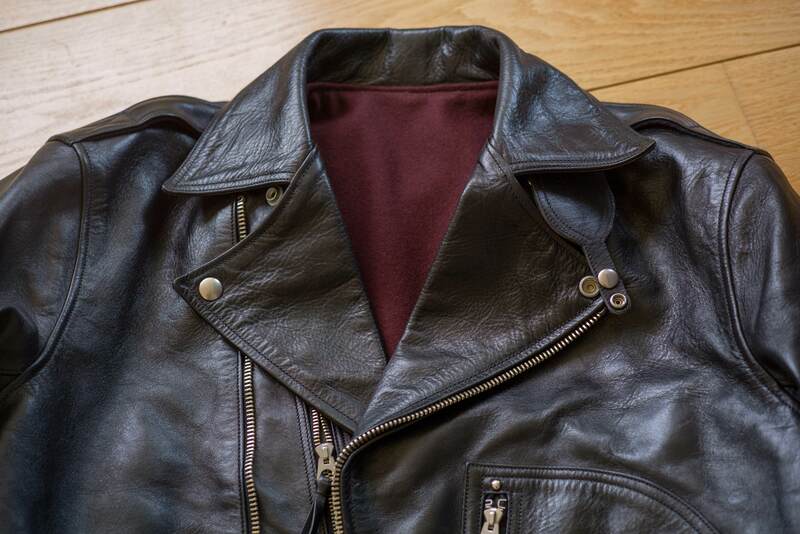 What do they call this leather? Thanks, purchased from The Rising/ Mirror Ball in japan, leather is Rude black. Freewheelers are special indeed! I wish I could get such a fit from the centinela!! WOW!! What a cool jacket and perfect fit, congrats! Your collection is insane, well done. It is just perfect. I'll try to elaborate in another comment but it's drop dead gorgeous. Fantastic looking jacket, Carlos. Leather, details and fit are all completely on the nail! Wow man! That is just beyond cool. The jacket on a whole is just stunning, fit is perfect and the details are just delicious. I particularly like the way the liner mirrors the jackets back panel. Thanks, honestly, it looks even cooler in real life! Every leather freak should handle one of these if they can, it really is something different! 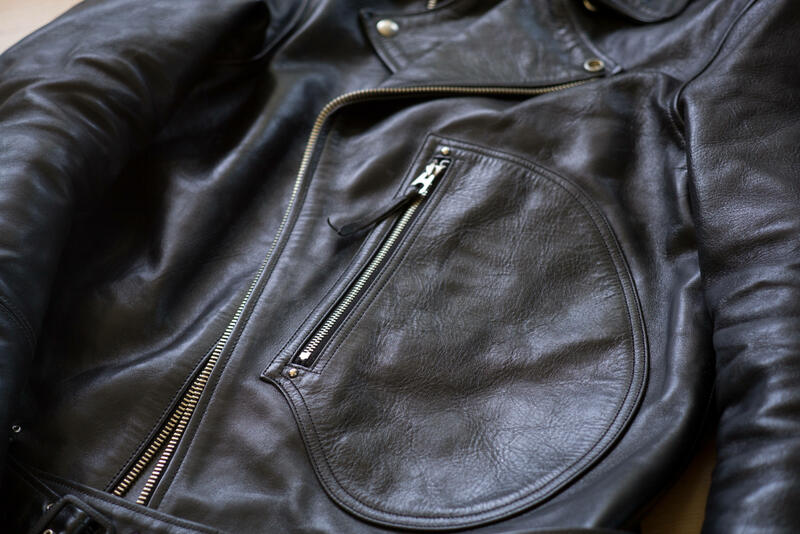 The lining is super cool, it really looks like they build a leather jacket, then make a perfect wool copy and attach both of them together. 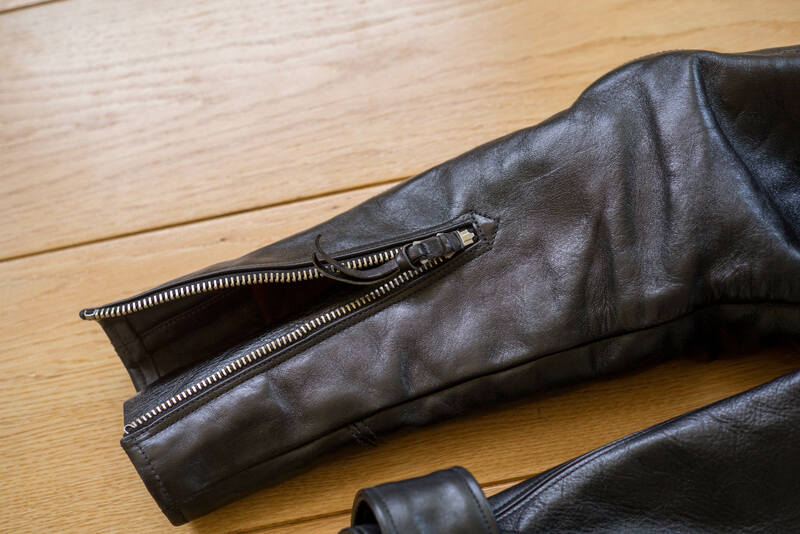 This makes the lining super tight to the leather all around, rather than than just flopping about inside the jacket. I really like it! I have been drooling on these pics since i got the Rin Tanaka book... Dangerous book! That's a good 30% more expensive than ordering straight from Japan! Wow. This is an awesome design and you can tell from the pictures the execution is flawless. Call me a heretic, but I like this even better than your Chevalier. This one here looks cleaner when left open unzipped. 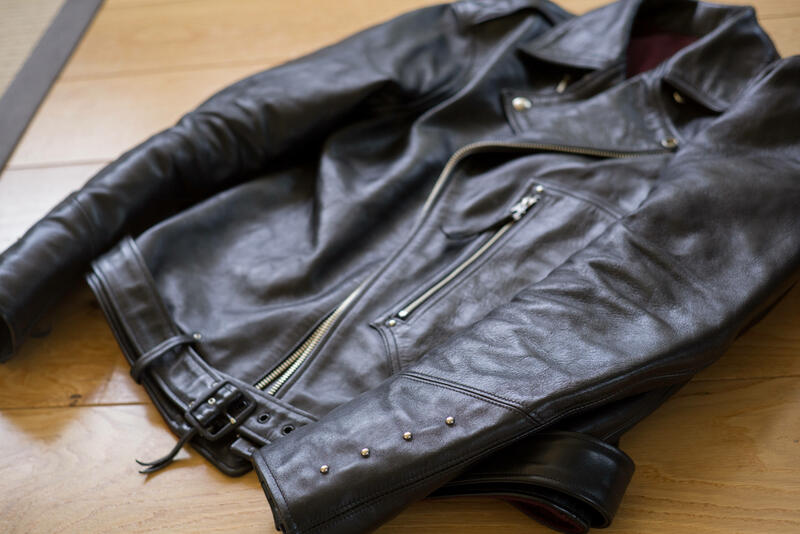 The jacket is a beauty and it fits as if it were made for you! I just checked out the mirror ball website and was blown away by some of the great jackets available there. Also very happy to find that everything is at least one size too small for me, whew! Carlos840 and El Marro like this. Looks Great Carlos!.. perfect jacket. 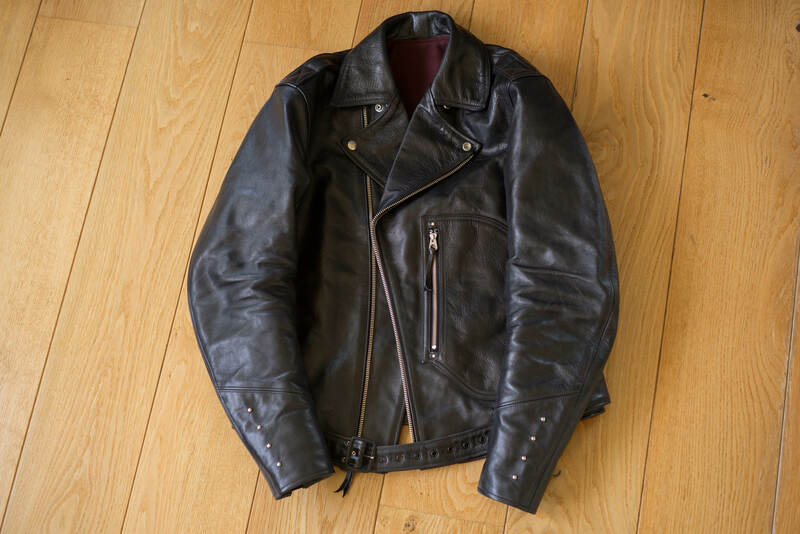 -Everything Freewheelers do is outstanding; shirts, jeans, jackets...certainly a product everyone should check-out. Congratulations on another great jacket! Well done, good choice. I now have two Freewheelers jackets (the Journeyman and the Brakeman). I had anticipated selling one, but I've decided against, they are just so wearable and the quality is outstanding. Congratulations Carlos. It does not get any better than Freewheelers. The workmanship is otherworldly. 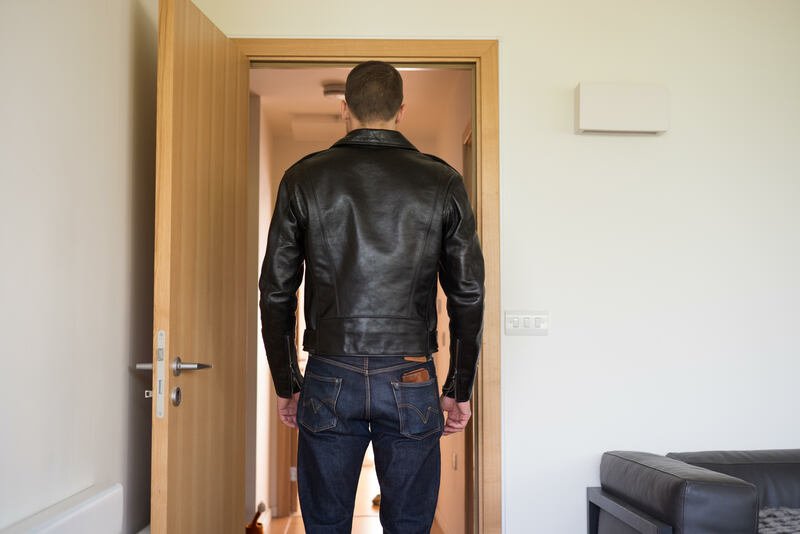 Unfortunately, none of their leather jackets fit me. As you noted, their leather jackets are very v-shaped with broad shoulders and narrow chests -- I do not have sufficiently broad shoulders. Additionally, the sleeves are often too short for me. The Brakeman is close, but no cigar. Thus, I am relegated to their non-leather jackets (I have the Brodovitch, Burnham and Utility). So true. Freewheelers is my favorite brand. Wonderful quality, fabrics and details. I purchased their brown and black Subterranean Willie Dobby Stripe shirts two weeks ago, and concurrently reserved a few pieces from their Fall collection. Some of their stuff is a bit too old world for my taste, and their overuse of pockets borders on the comical, but their more traditional, middle of the road pieces are stellar. dudewuttheheck, Carlos840 and JMax like this. i thought you’d never get better than your himel but you’ve at least matched it here. i think freewheelers might allow for extra arm length. maybe i should look into that..... or just wait until my tenjin arrives later this week first!! Rude Black is just the color, not the leather. I'm not sure but I think I read somewhere that the leather is produced by Shinki.